The house is the first in the village on the coast road from the west. The design is contemporary, but draws upon the traditional form and materials of the many rows of terraced cottages with their gables towards the sea, found all along the Norfolk coast. The main part of the 5 bedroom house therefore has a traditional, long and narrow form, with the addition of a contemporary bay on the east side to give the width needed for the accommodation. A second structure appears visually separated, offset behind the house. The entrance leads off a courtyard on the south side into the main living space, subdivided by curved ‘mast’ columns and a fireplace shaped like a sail, finished in reflecting glass to catch the light. 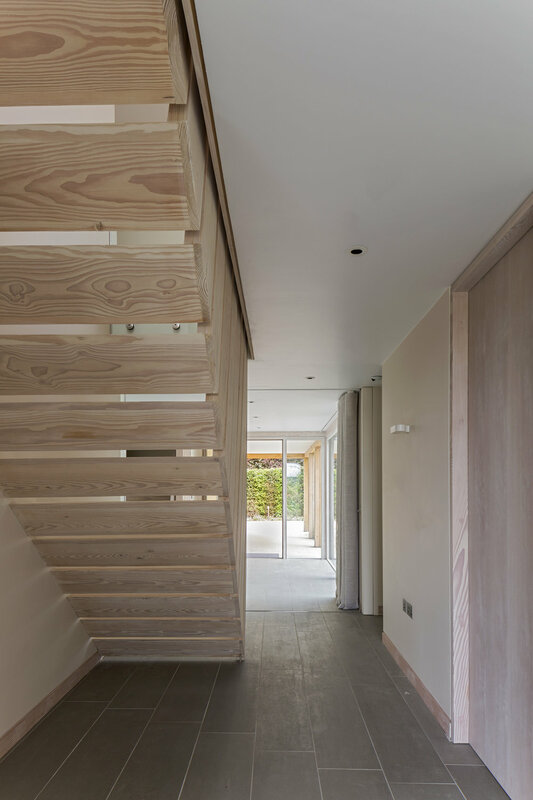 Sliding doors open out onto the terraces. A double height volume is bridged by smart glass to the first floor living room. A balcony runs along the west side. The main stair is cantilevered from the wall, with each triangular step turned & extended as the balustrade, with no connection between them. Internal doors slide into the walls, and wide board floors and clean cut stone add to the minimal aesthetic. Externally the house is built of a narrow brick with bands of flint work, hardwood cladding, terned stainless steel and black glazed pantiles. Perforated brickwork over the landing fenestration balances the main west elevation and filters the wide views from within. Extensive gardens lead down to a minimalist studio on the shore.